Learning how to brew a cup of perfect black tea is not difficult. Here Teavivre is going to introduce some useful guides for brewing black tea. Black tea is a type of tea that is more oxidized than oolong, green and white teas. Its fermentation degree reaches up to 80-90%. Studies show that caffeine contained in black tea leaves excites central nervous system and lifts mood, enhances memory. So, why not drink black tea on a regular basis for these benefits. Learning how to brew black tea is not about being unintelligible. Actually, Brewing black tea is as simple as drinking it, although there is no standardized way for you to do it. Grab your favorite black tea and teaset, and follow these basic steps to get your brew right. The following instructions a only for brewing black tea (For more information about black tea types, click here) and on our website you can also find useful information about brewing other teas. Although all black teas have some things in common, there are many variables –tea plant cultivar, leaf size, harvesting season, processing methods, ect. As I’ve mentioned previously, there is no ONE brewing strand for every black tea. Consider this a guid and try multiple times till you find the ideal taste favored by your palate. The water you use is perhaps just as important as the tea leaves. Using filtered or spring water is ideal (tap water is not recommended here because it may contain Chlorine added for sanitizing). If there is no other option, be sure to let it run cold briefly before adding to the kettle. Tea needs oxygen to infuse properly, and tap water loses oxygen when it stays in water pipes for long. Avoid distilled water, which can lead to flat taste. Start with fresh, cold water that has not been previously boiled (taste becomes stronger if water is kept overnight). Kettle made of iron, stainless steel, tin or glass is good for boiling water. However, please do not use aluminum or copper kettle which may spoil the taste of water. In the long run, you may observe a thick layer of scale accumulated inside your kettle. Scales consists of minerals that exist in the water. The mineral composition is reflected from the water you used. Some advocate that the scale is good for tea taste and needed not to be removed. This view is very biased and we suggest you clear them off regularly for the sake of your health. 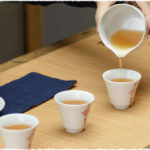 It is also important to stick to the same type of water whenever brewing tea. If source of water is changed, it may lead to bad taste caused by the different types of minerals contained in water. The easiest way to get an accurate measure for how much loose tea to use is by weighing it. An inexpensive kitchen scale or a digital gram scale that is calibrated in grams can give you more accurate measurements. So my best advice is to weigh any new loose tea you are trying for the first time. Once you are familiar with the leaf and know the right volume to use, you can remember for the next time and just measure out the number of teaspoons, depending on the type of leaf. In traditional Chinese Gongfu way, as a general rule of thumb, use about 3 grams of tea leaves per 3 ounces of water at 90 ℃. If you prefer Western Method (contrary to Chinese way) you could find the instructions unusually printed on the tea package. Measuring by weights is preferable because tea leaves come in different sizes. That’s why electronic scale is included in the above list of equipment. If you want to measure them by volume, leaf sizes should be cared about. For larger leaf sizes, you may want to use more. Let experiment to tell you what works for your taste. 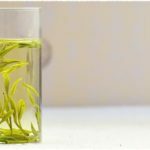 (Tips: my best advice is to weigh any new loose tea you are trying for the first time. Once you are familiar with the leaf and know the right volume to use, you can remember for the next time and just measure out the number of teaspoons, depending on the type of leaf. Heat the water. Place the water in a tea kettle and heat it just to a rolling boil. In some guidelines, they may ask you turn off the power when the water is just boiling. But in China, people do it in this way, for better water taste they may wait till the coin-sized water bubbles begin to appear on the surface of boiling water, and then turn off the power. This is not a rule but it is worth of your try. Depending on which expert you consult, the ideal temperature for black tea should be about 90℃ (194℉), which you can measure using a thermometer, or simply eyeball it. If you don’t use water that is hot enough, then you will never get it to taste right no matter how long you steep it for. The flavors lie in the chemical compounds, or flavonoids, these compounds are not released unless the water temperature is near boiling. Notes on brewing time: The required brewing time differ from tea to tea. To figure out the best time you need to practice and refer to the instructions. This step is very personalized. You are free to choose any cups of your favorable shapes. 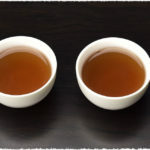 But, for your reference, the shallow cup with wide opening is ideal for you to appreciate the black tea aroma and flavor as well as its beautiful color. The addition of milk, lemon, or sugar may result in good taste. It all depends on your personal preference. If using milk, heat it gradually by adding the milk to the cup first, then pouring in the tea.Avoid combining milk with milk, or the milk may curdle. ①Heat the water. Place the water in a tea kettle and heat it just to a rolling boil. ④Wait 30s after boiling and let it cool down to the required temperature then pour it over tea leaves in tea pot. Tips: Place the lid on the teapot or, if using a cup, cover it with a lid or a small saucer. ⑥Sieve with a strainer and pour in cups. ⑦ Add milk, lemon, or sweetener (optional). Enjoy and reuse the tea leaves.